Scammers are always finding new ways to trick you, but many scams are based on an existing one, so being aware of the different types of scams is the best way to spot new ones. Though banks are trying their best by investing heavily in technology and cyber-security in order to beat the best of hackers, there are some lawbreakers that can still use some stratagem in an attempt to obtain money from your bank account at an ATM Station but the most wow about such incident, it might have happened while you are relaxing in your bedroom with your ATM card carefully kept in the brief-case beside you. It was difficult to prove to the bank it wasn’t you since all the details were supplied to the banking payment system tallied with yours. 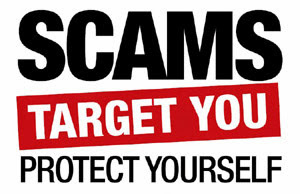 We agree that the percentage of scams were reduced by 85 per cent through the introduction of the token-text authentication system and chip-pin cards but it can't be eradicate totally, scammer also have new tools to ensure you either make the payments or willingly ‘share’ your banking details as they are more knowledgeable than the average ATM card holder. The best way you can prevent this is to be fully aware of the possible dangers that lurk in cyberspace. If your wallet or bag gets stolen, chances are that your ATM will be close to your ID card. Fraudsters can easily withdraw with your card if you are the type that use cheap passwords like date of birth as your PIN. The best way to prevent this is to use more secure passwords. In case you lose your card, don’t wait till you begin to receive alerts, report to the bank immediately. While pretending to come from an original bank, they send out emails designed to lure you into revealing your banking/personal password, token pins or text codes which is then used to access your bank accounts online. Such mails comes with link which if clicked, redirects you to a cloned site (fake site that looks like your bank's site) where your data will be captured by the fraudsters. No bank will need your password details for any upgrade. Ignore any email requesting such. Avoid clicking on such links and avoid using public computers for personal banking transactions. When you spot a phishing scam, report it to the bank immediately. This allows the bank to take the necessary actions that get the website blacklisted, banned or taken down. With the emergence of text messaging systems which allow users to send bulk SMS while customising the name of the sender, fraudsters can dupe you if your business relies more on alerts systems (email or text). Akin (not real name) is a car dealer who told a customer to go on and make payment at the bank while he waited patiently for a text message. No sooner had he received the text message from the ‘bank’ than he released the car only to realize later that the text message from the ‘bank’ was fake. He had clearly fallen victim of advanced text fraud. While most bulk texting gateways are already taking precautions to vet messages before they go out, always try to confirm payment independently from your account officer, your bank balance on your ATM, online banking channel or through systems created by the bank. Be wary of a credit alert that doesn't show your account balance. Some crooks especially at nights, force their victims to withdraw cash from an ATM by threatening them with a gun. Use only bank ATM machines in well-lit, high-traffic areas. ATMs inside busy supermarkets are considered safer. Don’t use ATM machines that are remote or hidden, such as being located behind buildings, behind pillars, walls, or away from public view. Beware of obvious hiding places like shrubbery or overgrown trees. Avoid ATMs where people are lurking around. Since you cannot return the money to the ATM, don’t waste time counting money at night. If the precautions above been take properly, those crooks won't find it easy to obtain your money from your bank account. Don't just read and work away. Please Save your friends and families account from been scam by click on any of the Share/Like buttons. Simply ask any question by using the comment box below.